“Pet Aqua Comb” – makes washing enjoyable for your pets. Pet Aqua Comb is designed to wash pets from the skin and hair roots outwards. Offered in two comb lengths-short comb (Black Aqua Comb) for most pets and medium length (Grey Aqua Comb) for pets with long hair. How does a Pet Aqua Comb work? The comb fingers open tunnels in the fur to allow the intense water spray to shoot directly onto the skin surface flushing the dirt, dead hair etc. up and out of the fur coat. 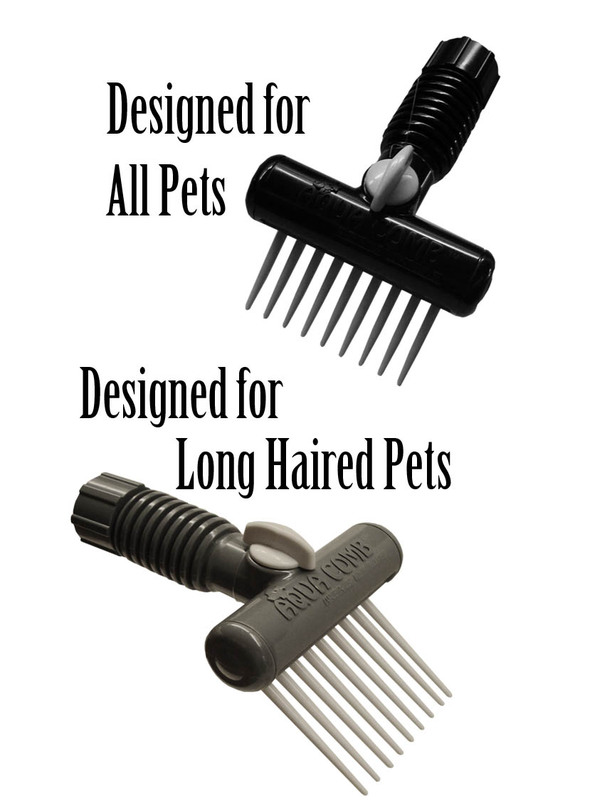 Retailers – Order Your Pet Aqua Combs Today. Deep Hydro massage relaxes the animal, making wash time easier and more fun! Water spray removes all the soap residue and will help restore good healthy skin. Their coat will be brighter and cleaner. Wash weekly and you will not have dead hair or doggy odor in your home! 4) Comes in two comb lengths; short for most pets and medium length for pets with long hair. 5) Great for 4-H members with cows, pigs, goats etc. The Pet Aqua Comb is easy to use and will save you both time and money when grooming your pets. Pet Aqua Combs are a game changer in the pet industry! The combined benefit of a relaxing deep hydro massage and wound therapy gives your dog more energy, healthier skin and coat. Rescue animals greatly benefit from our Aqua Combs. The shampoos offered for your pets have many beneficial ingredients, but if you do not completely remove them in the wash cycle they can and do often cause pet skin and coat issues. The Pet Aqua Comb removes all; eliminating these issues. Pet Aqua Combs work so well that if you have a pet with dry skin issues you can wash them using shampoo every other time to maintain a healthy level of skin oil and still have a clean pet. 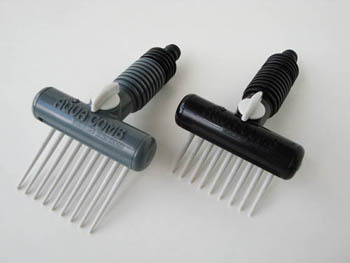 Aqua Combs can now be ordered with a quick disconnect instead of the standard ¾” threaded nut. The new attachment system works on all ¾” hose quick disconnect systems sold in Europe, New Zealand and Australia. It is an optional system in the USA for ¾” hoses and in Canada with the ¾” hose Gardena quick disconnect system. Interested in the Pet Aqua Comb?